The Belize Marine Conservation and Climate Adaptation Project is a US $6 million climate change project funded by the World Bank. It is scheduled to begin early this year, according to the Coastal Zone Management Authority and Institute. The project is to go on for five years and is geared towards strengthening the resilience of the Belize Barrier Reef System to climate change. Strengthening will come about through ecosystem-based marine conservation and climate adaptation measures. The plan is to employ a two-track approach which combines ecosystem-based adaptation with enabling policy and legal frameworks as an effective long-term approach to help strengthen the resilience of the reef system against adverse effects of climate change. The Protected Areas Conservation Trust (PACT) will be in charge to implement the project, to support improvement of the reef’s protection regime, expand and enforce measures of marine protection and to create replenishment zones in strategically selected locations. These zones will promote viable and sustainable alternative livelihood for affected users of the reef. The project will also raise awareness and disseminate information regarding the overall health of the reef ecosystem and the resilience of coral reefs. Chief Executive Officer of the Coastal Zone Management Authority, Vincent Gillett said the launch of the project will allow CZMAI to significantly expand and improve its role in coastal zone management. He added that support for the Belize Coastal Zone Management Plan will be high among the activities under the adaptation fund. The Project entitled: “Belize Climate Resilient Infrastructure Project” (BCRIP) will improve and strengthen Belize’s climate resilience and its anticipated impacts of climate change in relation to infrastructure, in particular, to a 24km section of the Philip Goldson Highway , a primary roadway linking the cities in the North of Belize to the International Airport located on the outskirts of the greater Belize City area and if possible, other smaller sections of primary roadway on the George Price Highway nearing the Belmopan encountering similar vulnerabilities. The Government of Belize through the Belize Social Investment Fund/Belize Climate Resilient Infrastructure Project (BCRIP) will enable Belize to effectively implement mitigation and adaptation strategies in the war against this global threat as it relates to the negative effects on Belize’s economic growth and welfare of its present and future generations. Signing the loan agreement last week at World Bank’s office in Washington, D.C. USA on behalf of the Government of Belize was Belize’s Ambassador in Washington, D.C. H.E. Ambassador Nestor Mendez. Click photos for larger pictures! BCRIP is designed to increase the resilience of the Belizean people to climate change and its impact on the environment and economy of Belize. The project will initially rehabilitate 24 kilometers of roads, improve the Ministry of Works’ capacity in road maintenance and training of road maintenance personnel, operationalize the National Land Use Policy, as well as improve government’s personnel capacity in flood mitigation systems. Project activities will include but not limited to hydrological improvements, small-scale creek alignment and river training; river embankments protection, re-sizing of culverts and some replacement of culverts with small bridges to improve hydraulic capacities, road rehabilitation, road widening and shoulder improvement, and re-establishment of improved road safety features. 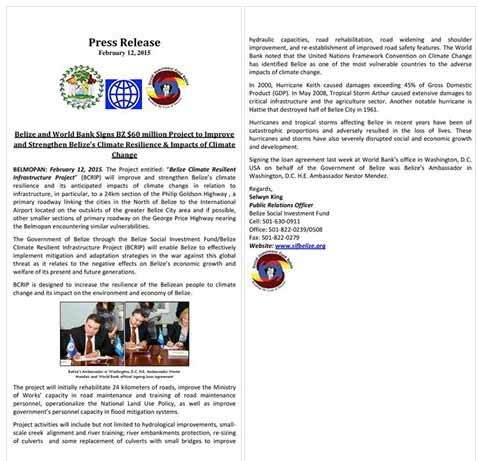 Of note is that the United Nations Framework Convention on Climate Change has identified Belize as one of the most vulnerable countries to the adverse impacts of climate change. In 2000, Hurricane Keith caused damages exceeding 45% of Gross Domestic Product (GDP). In May 2008, Tropical Storm Arthur caused extensive damages to critical infrastructure and the agriculture sector. Another notable hurricane is Hattie that destroyed half of Belize City in 1961. Signing the loan agreement at World Bank’s office in Washington, D.C. USA on behalf of the Government of Belize was Belize’s Ambassador in Washington, D.C. H.E. Ambassador Nestor Mendez.